Show some love for the bride to be or for all the party by treating them to some love heart sweets in their gift bag. Each packet have seven love heart sweets with hidden messages on them saying thinsg like try love, don't cry and more. Treat your girls and fill up a bag with goodies! Ingredient Information: Sugar, Acidity Regulator: Malic Acid; Stearic Acid, Sodium Bicarbonate, Modified Starch, Magnesium Stearate, Anti-Caking Agent: Magnesium Carbonate; Flavourings, Colours: Anthocyanin, Beetroot Red, Copper Chlorophyllin, Curcumin, Lutein, Paprika. Suitable for vegetarians. Free from artificial colours. Gluten Free. Create the memories of your special night! 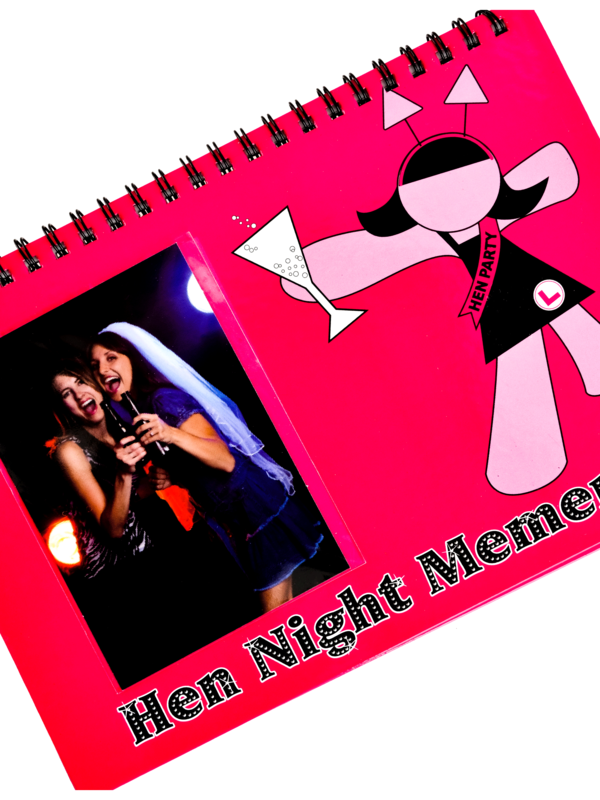 Then present them in this special hen party memento book! Make it as fun or as personal as you like. Print the pictures and stick them in with comments of the night. Then present it to your bride to be as a gift! It will help her to remember the great time she had and what a special friend you really are! With a sleeve to add your own photo on the front cover and 10 plain ring bound white pages she will love it! You also can use it on the night to ask all the girls to leave comments and marital advice! Showing our 3 Hen Party Memento- Photo, Memory, Comments Book reviews with an average rating of Excellent. Would you like to write a review? Review - 2nd one of these i have purchased a cheap keepsake for the bride! 2nd one of these i have purchased, a cheap keepsake for the bride!